Free, coffee, tea, and bagels are available every Sunday. Free donuts, juices, coffee, tea, and bagels are available on the first Sunday of each month. On the third Sunday, get 2 pancakes and 2 sausages for only $1.00. Royal Rangers is seeking empty, clean 2-liter bottles for an event by September 23, 2015. Please bring them to the church office. There will be a new workers class for those who have not been cleared to work with our children and teens. Please see Pastor Ben for more info. Join us tonight at 5:30 PM. Click here to view the list of adult electives. We hope that you'll be part of one of our four exciting adult electives! With some kids recently moving up into PowerLine, we now have spaces open for your kids to join the Incredible Islands Weekly Bible Challenges during your time away from church. For more details about this wonderful and FREE option for your children, please see Ms. Lucie. Also, if your child is currently registered but has forgotten his/her password, e-mail or call Ms. Lucie so she can reset the game and get your child involved. Reminder: they earn points during morning services which can turn into tangible rewards if they play the games during the week. Reminder to all 2015 VBS workers that if you have not yet returned your orange Praise Assembly Staff shirt, please do so. We want to be prepared for the next time we need them. 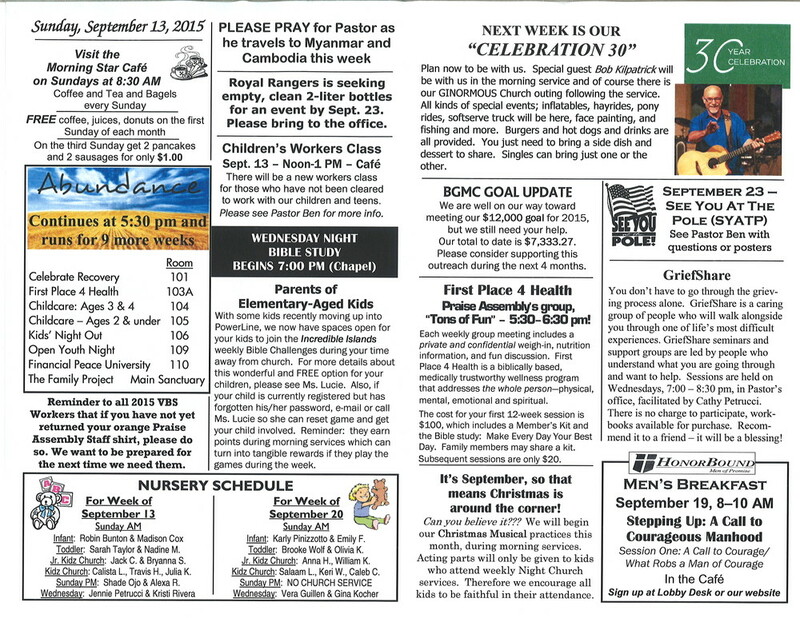 Next week is Celebrate 30 and we hope you plan to join us! Special guest Bob Kilpatrick will be with us in the morning service and of course there is our GINORMOUS church outing following the service. All kinds of special events; inflatables, hayrides, pony rides, soft-serve truck will be here, face painting, fishing, and more! Burgers, hot dogs, and drinks are all provided, you just need to bring a side dish and dessert to share. Singles can bring just one or the other. We are well on our way toward meeting our $12,000 goal for 2015, but we still need your help. Our total to date is $7,333.27. Please consider supporting this outreach during the next 4 months. Each weekly group meeting includes a private and confidential weigh-in, nutrition information, and fun discussion. Praise Assembly's group, "Tons of Fun" starts Next Sunday, August 30, 5:30 - 6:30 pm. Maybe you're struggling with losing 5-10 pounds or are battling obesity. Perhaps you want to increase your knowledge about nutrition, to get help with implementing a consistent exercise plan or to learn how to develop a healthy lifestyle for your family. Whatever your reasons, you'll find that First Place 4 Health is a biblically based, medically trustworthy wellness program that address the whole person - physical, mental, emotional, and spiritual. The cost for your first 12-week session is $100, which includes a Member's Kit and the Bible study chosen for this session, Make Every Day Your Best Day. Family members may share a kit. Subsequent sessions are only $20. You don't have to go through the grieving process alone. GriefShare is a caring group of people who will walk alongside you through one of life's most difficult experiences. GriefShare seminars and support groups are led by people who understand what you are going through and want to help. Sessions are held on Wednesdays, 7:00 - 8:00 pm, in Pastor's office, facilitated by Cathy Petrucci. There is no charge to participate, workbooks available for purchase. Recommend it to a friend - it will be a blessing! It's September, so that means Christmas is around the corner! Can you believe it??? We will being our Christmas Musical practices this month, during morning services. Acting parts will only be given to kids who attend weekly Night Church services. Therefore we encourage all kids to be faithful in their attendance. 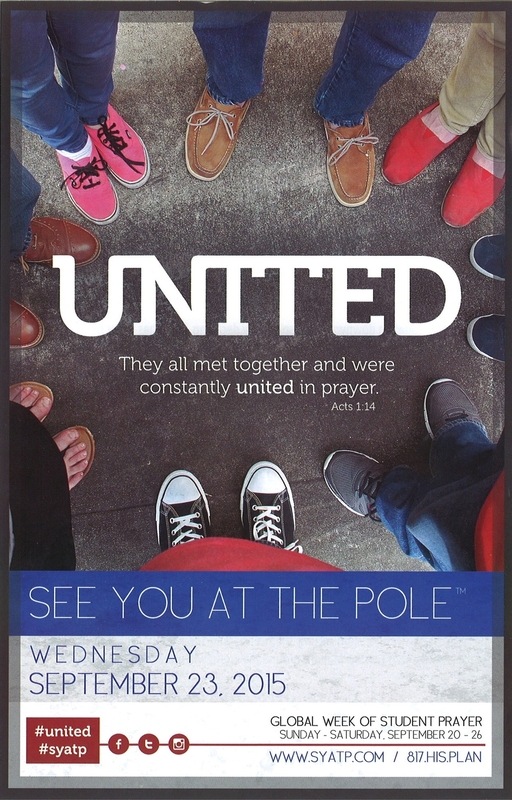 See You At The Pole! On September 23 at 7 a.m. local time, SYATP happens at a school flagpole where students gather all around the globe in every time zone to pray. See Pastor Ben with questions or posters.